Black portfolio bag with big white sol key. The bag has a zipper at the top. 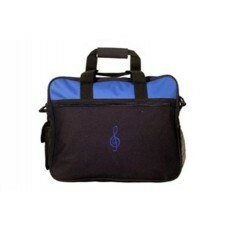 It can contain large sh..
Work or study bag, also computer bag in waterproof nylon, in black and blue. 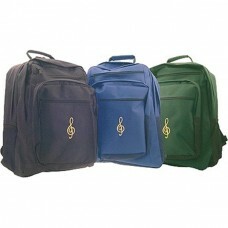 It has two handles in b..
Large bag in black nylon fiber, with large keyboard and white musical notes. 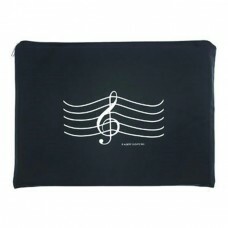 The bag is very light a..
Waterproof shoulder bag in blue with black profiles and large sol or treble clef in gold-colored sil..
Large nylon fiber bag, with music score and white notes. The bag is very light and foldable. It can .. Portfolio bag with piano keyboard at the bottom. The bag opens on three sides with a long zipper. Th.. 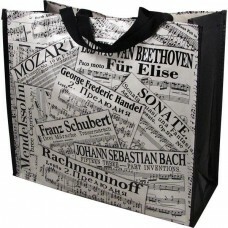 Portfolio bag with white score on black. The bag has a zipper at the top, on the front. 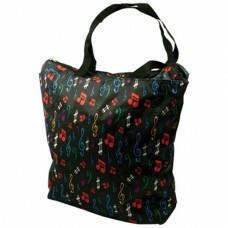 It can conta..
Shopping or everyday bag in black satin with notes and very colorful musical signs. 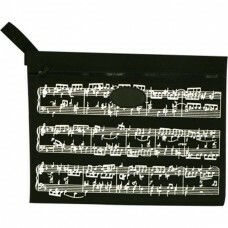 The bag has zipp..
Glittery gold-colored bag with G clef and musical score printed in black. The bag is very light. It .. 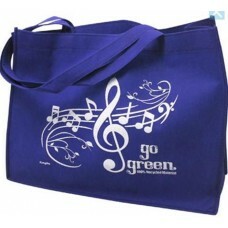 Bag in recycled material, in various colors, with G clef on music score. 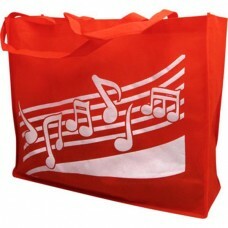 The bag is very light and f..
Nylon fiber bag in various colors, with large musical eight printed in white. 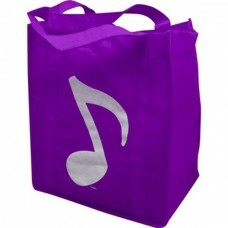 The bag is very light,..
Large bag with two handles in black grosgrain that can be used to hold musical material or for every..
Large bag in durable black cotton with two handles. It can be used as a container for musical things..